While the rich countries were most affected by the global economic crisis, there are signs of recovery. Although India and China won’t go back to the days of double-digit growth, other emerging countries, especially in Sub-Saharan Africa, paint a more hopeful picture. But the scale of the recovery won’t help the unemployed much, whose numbers are only set to be growing. In 2013, the unemployed grew by 5m to 202m people globally. According to a new report published by the International Labour Organisation (ILO), this number is set to grow by a further 13m by 2018, even if the rate of underemployment remains same. 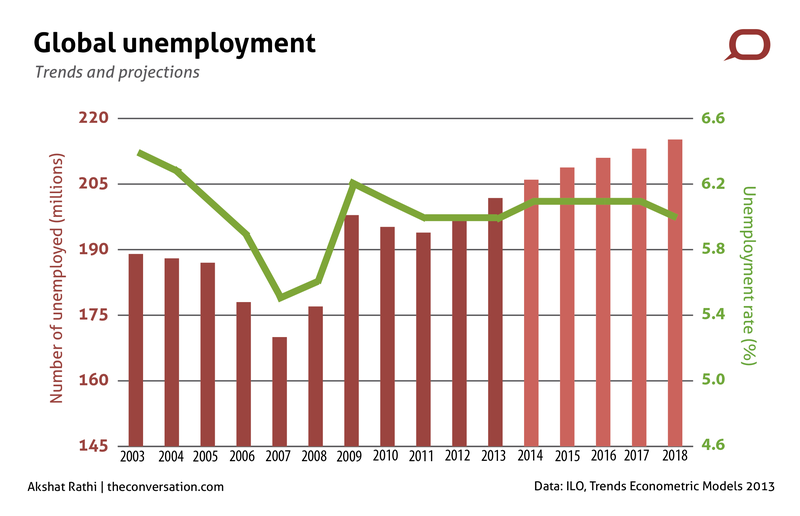 In countries such as Greece and Spain, the average duration of unemployment has reached nearly nine months. The ILO’s worries are threefold. First, the recovery is not strong enough to reduce the growing number of unemployed. Second, the fundamental causes of the global economic crisis are yet to be properly tackled. Third, the crisis has forced even those employed into more vulnerable jobs. The young have suffered the most. About 74m people between the ages of 15 and 24 were unemployed in 2013, which is 1m more than 2012. The global youth unemployment rate has reached 13.9%, more than double the global average. These numbers also mask the large number of underemployed people. In countries like India, where education has boomed in the last few decades, there are now more people with degrees than there are jobs for them. According to Craig Jeffrey, professor of development geography at the University of Oxford, India has a whole class of educated people just “doing timepass” (passing the time). And, he writes on The Conversation, this is not just the case for India. Other Asian countries, Latin America, Africa and many Europen countries have such a group, too. It seems whether you have a degree or not, that dream job might remain unreachable for a little longer.